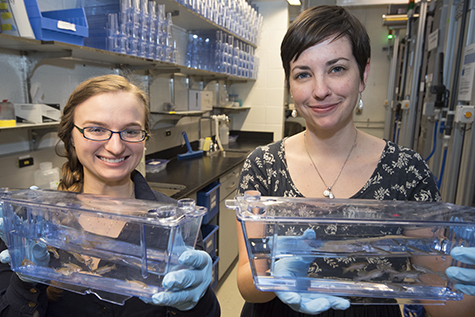 Using Washington University’s zebrafish facility, graduate student Sarah Ackerman (left) and senior author Kelly Monk, PhD, identified a gene that regulates how well the wiring of the central nervous system is insulated. Healthy insulation is vital for the speedy propagation of nerve cell signals. The finding, in zebrafish and mice, may have implications for human diseases like multiple sclerosis, in which this insulation is lost. The study appears Jan. 21 in Nature Communications. Nerve cells send electrical signals along lengthy projections called axons. These signals travel much faster when the axon is wrapped in myelin, an insulating layer of fats and proteins. In the central nervous system, the cells responsible for insulating axons are called oligodendrocytes. The research focused on a gene called Gpr56, which manufactures a protein of the same name. Previous work indicated that this gene likely was involved in central nervous system development, but its specific roles were unclear. In the new study, the researchers found that when the protein Gpr56 is disabled, there are too few oligodendrocytes to provide insulation for all of the axons. Still, the axons looked normal. And in the relatively few axons that were insulated, the myelin also looked normal. But the researchers observed many axons that were simply bare, not wrapped in any myelin at all. Without Gpr56, the cells responsible for applying the insulation failed to reproduce themselves sufficiently, according to the study’s senior author, Kelly R. Monk, PhD, assistant professor of developmental biology. These cells actually matured too early instead of continuing to replicate as they should have. Consequently, in adulthood, there were not enough mature cells, leaving many axons without insulation. Monk and her team study zebrafish because they are excellent models of the vertebrate nervous system. Their embryos are transparent and mature outside the body, making them useful for observing developmental processes. In a companion paper in the same issue of Nature Communications, senior author Xianhua Piao, MD, PhD, of Harvard University, and her co-authors, including Monk, showed similar defects in mice without Gpr56. In past work, Piao also has shown evidence that human defects in Gpr56 lead to brain malformations related to a lack of myelin. Monk also said that Gpr56 belongs to a large class of cell receptors that are common targets for many commercially available drugs, making the protein attractive for further research. The investigators pointed out its possible relevance in treating diseases associated with a lack of myelin, with particular interest in multiple sclerosis. In theory, if the precursor cells can be pushed to mature into adulthood, they may become capable of producing myelin. According to Monk and Ackerman, possible future work includes using the zebrafish model system as a drug-screening tool to search for small molecules that may flip that switch. The work led by Washington University was supported by predoctoral fellowships from the National Institutes of Health (NIH), NS087801 and NS079047; and by grants from the NIH, R01 NS079445; and from the Edward J. Mallinckrodt Foundation. Ackerman SD, Garcia C, Piao X, Gutmann DH, Monk KR. The adhesion-GPCR Gpr56 regulates oligodendrocyte development via interactions with G-alpha12/13 and RhoA. Nature Communications. January 21, 2015. The work led by Harvard University was supported by grants from the NIH, P30 HD18655, R01 NS057536, F31 NS087801, and R01 NS079445; and by the William Randolph Hearst Fund, the Leonard and Isabelle Goldenson Research Fellowship and the Cerebral Palsy International Research Foundation. Giera S, Deng Y, Luo R, Ackerman SD, Mogha A, Monk KR, Ying Y, Jeong SJ, Makinodan M, Bialis A, Chang B, Stevens B, Corfas G, Piao X. The adhesion G protein-coupled receptor GPR56 is a cell autonomous regulator of oligodendrocyte development. Nature Communications. January 21, 2015.